± LAN to Broadband Connectivity (WAN): Routers, Firewall, Etc. Share your single internet connection with all your computers on the network. Additional Internal Hardware - Network Cards, Hard Drive, Removable Storage, Modems, Sound Cards, Video Cards, Image Capturing Cards, Etc. Additional Software - Suites, Etc. Peripherals and External Hardware - Printers, Scanners, Digital Cameras, Video Cameras, Speakers, Microphones, Keyboards, Mouse, Touchpad, Trackball, Etc. 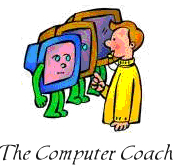 The Computer Coach handles the computers so you can do your job better and not worry about the technology to keep it efficient.